jng (SAN FRANCISCO): Though your teachers might require you to purchase the third (and so far, the latest) version, this second version's content still is very similar. Chapter and page numbers are obviously different, but its marked down price is more affordable and likely beats the monetary loss of buying/selling the newest edition. Check with your teacher whether using this book is okay, as the older material might not reflect everything taught in lecture. Garland Science/Taylor & Francis Group, 9/25/2003. Hardcover. Very Good. Some very light shelf wear, otherwise a good clean copy. Still has CD. Garland Science/Taylor & Francis Group. Hardcover. 081533480X New Condition. . New. Garland Science/Taylor & Francis Group, 2003-09-25. 2. Hardcover. Used:Good. Garland Science/Taylor & Francis Group. Hardcover. 081533480X Like New Condition. . Fine. Garland Science/Taylor & Francis Group, 2003-09-25. Hardcover. Good. Garland Science/Taylor & Francis Group. Hardcover. 081533480X Ships from Tennessee, usually the same or next day. . New. 2003. Garland Science/Taylor & Francis Group, September 2003. Hardcover Hardcover. Good - Cash. Minor wear to cover and pages. Great condition. Unmarked text, secure binding. General use wear to the surface, edges, corners and ends. Garland Science/Taylor & Francis Group. Hardcover. 081533480X Crisp pages and tight binding. Light shelf wear on cover. . Fine. Garland Science/Taylor & Francis Group. Used - Good. Ships from the UK. Former Library book. Shows some signs of wear, and may have some markings on the inside. 100% Money Back Guarantee. Your purchase also supports literacy charities. Garland Science/Taylor & Francis Group. Used - Good. Good condition. With CD! Writing inside. Second edition. Garland Science/Taylor & Francis Group. Used - Very Good. Very Good condition. With CD! 2nd edition. Garland Science/Taylor & Francis Group. Used - Very Good. Ships from Reno, NV. Great condition for a used book! Minimal wear. 100% Money Back Guarantee. Shipped to over one million happy customers. Your purchase benefits world literacy! Garland Science/Taylor & Francis Group. Used - Good. Shows some signs of wear, and may have some markings on the inside. Garland Science/Taylor & Francis Group. Hardcover. 081533480X FAST SHIPPING!! No CD Included. Access code may be previously used. Heavy wear, wrinkling, creasing or tears on cover and spine. Heavy writing and highlighting. Cover has used book stickers or residue. Marker on cover or bottom edge of book. Book may have additional damage or defects not listed above. . Fair. Garland Science/Taylor & Francis Group. Hardcover. 081533480X Reinforced binding. Underlining/margin notes. Book is in ACCEPTABLE condition, and a great value based alternative for those wishing to save money! Text is intact and legible.Satisfaction Guaranteed. Please contact us with any inquiries. We ship daily. We only ship Internationally via FedEx with tracking which is why our shipping price might be higher than others. . Fair. Garland Science/Taylor & Francis Group. Used - Good. Garland Science/Taylor & Francis Group. Hardcover. 081533480X Good Condition. Has some writing/highlighting. Includes Unopened CD/DVD(s). Five star seller - Buy with confidence! . Good. Garland Science/Taylor & Francis Group. Used - Acceptable. Used - Acceptable Hardcover. TEXTBOOK W/ CD! WATER DAMAGED! 2nd Edition Not perfect, but still usable for class. Ships same or next day. Expedited shipping takes 2-3 business days; standard shipping takes 4-14 business days. U.S.A.: Garland Science/Taylor & Francis Group. Hardcover. 081533480X Good condition. Has highlighting. 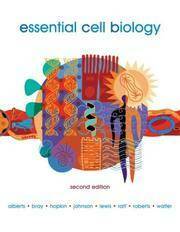 Essential Cell Biology, Second Edition 2nd Edition by Bruce Alberts (Author),? Dennis Bray (Author),? Karen Hopkin (Author),? Alexander Johnson (Author),? Julian Lewis (Author),? Martin Raff (Author),? Keith Roberts (Author),? Peter Walter (Author) Product details Hardcover: 740 pages Publisher: Garland Science/Taylor & Francis Group; 2 edition (September 25, 2003) Language: English ISBN-10: 081533480X ISBN-13: Product Dimensions: 8.5 x 1.2 x 10.8 inches . Good. 2003. Garland Science/Taylor & Francis Group. Used - Good. Used - Good Hardcover. INCLUDES CD 2nd Edition May contain highlighting/underlining/notes/etc. May have used stickers on cover. Ships same or next day. Expedited shipping takes 2-3 business days; standard shipping takes 4-14 business days. Garland Science/Taylor & Francis Group. Hardcover. GOOD. Spine creases, wear to binding and pages from reading. May contain limited notes, underlining or highlighting that does affect the text. Possible ex library copy, thatâll have the markings and stickers associated from the library. Accessories such as CD, codes, toys, may not be included.